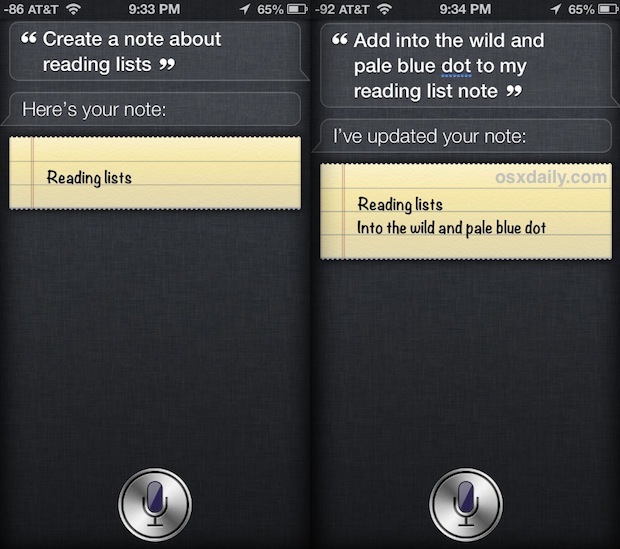 Siri can create new notes, modify existing notes, and find old ones, each of which is tied to the cross iOS & OS X Notes app. This is an excellent trick to use in situations where you want to make a note or modify an existing one but you can’t spend much time fiddling with your iPhone or iPad. For example, the next time you’re driving and listening to the radio or an interesting podcast and hear a book or TV show mentioned that you want to check out later, have Siri make a note about it by saying “Add Shantaram to my reading list notes”. Or the next time you open the refrigerator and discover there’s no milk, tell Siri to “Add milk to my grocery list notes.” In a lot of cases, it’s also much easier to just ask Siri to search your notes about a topic than it is to type something out on the touch keyboard, and that can be done too by summoning Siri and saying something like “Find my notes from February about books.” Here are a few language examples of how this can work. You may have found this out yourself by getting Siri to list commands, but it’s not directly obvious unless you’re either winging commands at Siri or digging around in the voice assistants own listings. Keep in mind that Notes automatically sync between your iOS devices and Macs, so long as each device is configured to use the same iCloud account. This is particularly useful if you ask Siri to add something to a Note that is also pinned to the desktop of Mac OS X, since you can be on the go with an iPhone and add things just by talking that will then be waiting for you on the Mac when you get back to it. Another helpful use is using Siri this way to perform thought dumps, knowing all the notes content syncs between your devices, you can quickly make a note about something worthwhile and not worry about forgetting it or having to write it down.